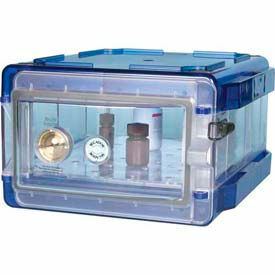 Bel-Art Vertical Desiccator Cabinets Provide Reliable, Safe Storage Of Moisture-Sensitive And Light-Sensitive Products. Bel-Art Vertical Desiccator Cabinets are made with Durastar® co-polyester build to block 99% of UV light and is resistant to staining. Perforated shelves ensure circulation. Large doors maximize access to interior space. Patented seal design, tab latches and security loops ensure secure closure. Cabinets are available in several sizes. 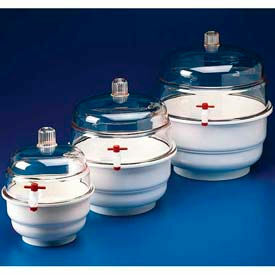 Bel-Art Vacuum Desiccators Hold A Full Vacuum At Room Temperature For 24 Hours. Bel-Art Vacuum Desiccators feature polypropylene stopcock with PTFE plug for a controlled entrance of air. Neoprene O-ring ensures a tight seal down to 0°C. Flat-top dome ensures maximum interior space. Available in several sizes in Clear or White. 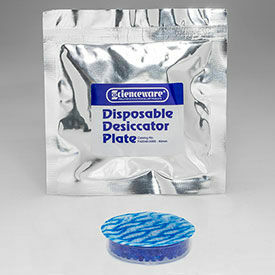 Convenient, easy-to-handle cartridges with Natrasorb® TI indicating silica gel beads fit Scienceware® "Space Saver" desiccators, in addition to other plastic desiccators of similar size. Beads change color from blue when dry to pink when moist and are contained in a durable, polyester felt bag with a perforated Mylar® cover sealed in place. Saturated gel can be regenerated in a 150°C (300°F) vented oven for 3 hours or more (depending on size) until blue color returns. May be regenerated repeatedly without degradation. Individually sealed in moisture proof pouches. Clear polystyrene dish allows instant visual inspection of silica gel, which changes in color from blue to pale pink as it absorbs moisture. A highly porous membrane covers the dish providing excellent moisture absorption. Desiccant can be easily regenerated by heating cartridges in a 50°C (122°F) oven overnight. For more rapid drying, cut the membrane, transfer the spent gel crystals into a glass or porcelain dish, and place in a 150°C (300°F) oven for one hour. Silica gel is inert, non-corrosive and non-toxic. 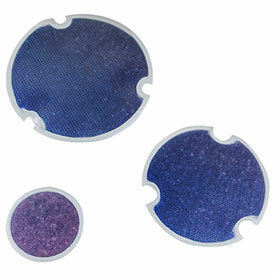 Fits "Space Saver" desiccators, in addition to other plastic desiccators of similar size. Individually foil sealed. Bel-Art F42043-0000 Polycarbonate Vacuum Chamber and Plate, 0.2 Cu. Ft.